Manufacturer of a wide range of products which include super napier grass stem cuttings (0.75 pisa per cutting). 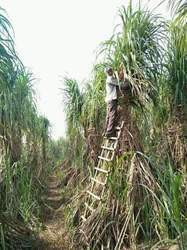 Super Napier is a Hybrid Napier Grass obtained by crossing Elephant Grass and Pearl Millet. 5. Highly suitable for silage because Pakchong 2 Super Napier has WSC 18 (water soluble carbohydrate), so no need to add any additives while making silage. The first cut is taken from 75 to 90 days after planting and subsequent cuts are taken after intervals of 30 to 45 days. 7 to 8 cuttings per year and 50 to 60 tons per cutting depending upon the soil.